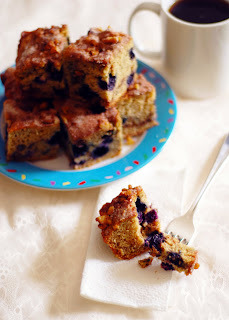 It occurred to me today that this is the last (not even full) week in April and I'd only posted a couple recipes here so far this month but I have been baking! Laziness, I guess. 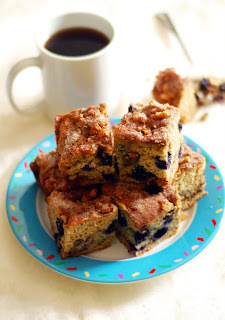 But this blueberry coffee cake is too good not to share. It's Saturday afternoon, I just wanted to make something springy for Sunday brunch and I had some blueberries in the freezer. These days especially, I really think the world is making things easier for dieters. It might take a little more research and a few more clicks on Google, but you can find a low calorie recipe for anything, I promise. 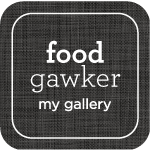 Whether or not they taste good is another story - and this does. This was so delicious! I followed the recipe exactly as it appears except I cut it into 16 squares instead of 12, which means the calories went down from 210 per piece to 160. Even if you aren't dieting, I highly suggest this recipe. It tastes just as good as any full fat, sour cream, cream cheese, butter-laden coffee cake - but it's so much better for you. Preheat the oven to 350 degrees F and spray an 8'' or 9'' square baking pan with cooking spray. Sift or whisk together the flours, baking soda and salt in a small bowl until well combined. In another small bowl, combine the granulated sugar, cinnamon and chopped walnuts. In a mixer fitted with the paddle attachment or with a hand mixer, beat the butter, canola oil and brown sugar until light and fluffy. Add the eggs one at a time, mixing well after each one is added, and then add in the vanilla. Next, add in the dry ingredients and the yogurt alternately, beginning and ending with the dry ingredients. 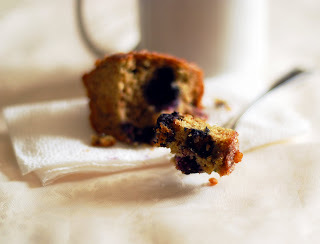 Finally, fold in the blueberries gently. Spread half the batter into the bottom of the greased pan. Sprinkle with half the cinnamon sugar/walnut mixture. Spread the rest of the batter on top of the nuts and then sprinkle the rest of the cinnamon sugar/walnuts on top. Bake in the preheated oven for 35 to 45 minutes, or until a toothpick comes out clean when inserted in the center. 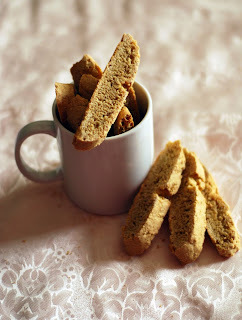 I used cinnamon, ginger and cloves in these. The original also called for some ground white or black pepper - I say use whatever spices make you happy and go for it. Feel free to add raisins or dried cranberries as well as nuts. 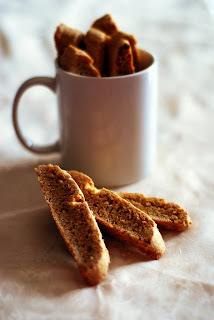 This is a great base recipe for biscotti. Sift or whisk together the flour, baking powder, baking soda, spices and salt in a small bowl and set aside. Whisk the eggs, yolks, sugar and vanilla together until it becomes lighter yellow in color. Sprinkle the dry ingredients over and fold in just until the dough comes together. Divide the dough into 2 parts and shape each half into a 13'' long by 2'' wide rectangle. Bake for about 35 minutes, or until the tops of the logs begin to crack. Take the sheet out of the oven and let it cool for 10 minutes. Decrease the oven temperature to 325 degrees. After 10 minutes, transfer the logs to a cutting board and slice into 1/2'' thick slices diagonally. 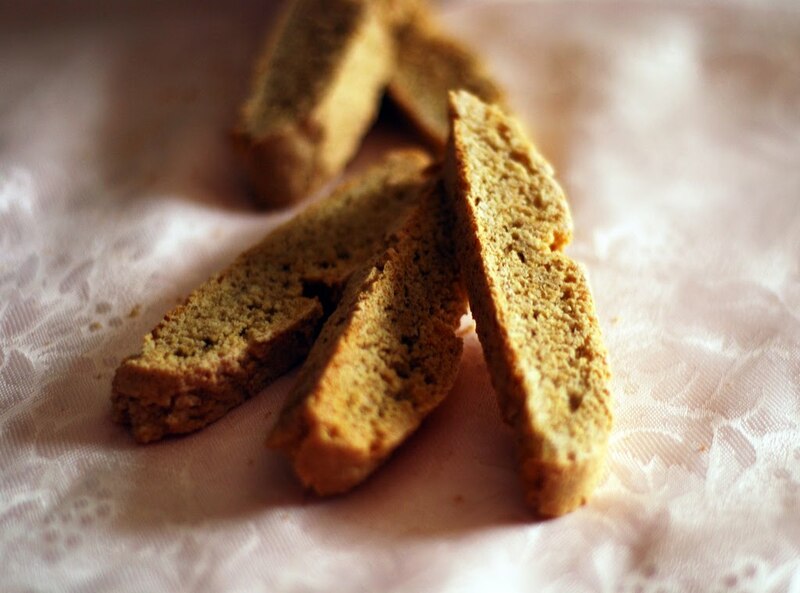 Place on the baking sheet, cut side up, and bake for 15 more minutes, flipping the biscotti over halfway though. Beth: "So before I actually started planning on this, how does carrot cake sound for your birthday?" Andy: "Carrot cake? With cream cheese frosting?" Beth: "Uh, yeah! Is that okay?" Andy: "YES please that sounds delicious!" 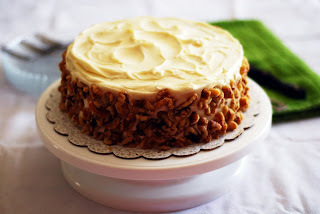 Before I started looking around for gluten free carrot cake recipes, I had no idea so many people were in love with carrot cake. But how can you blame them? Warm spice cake with flecks of carrot, coconut, chunky nuts and sweet raisins. Not to mention the perfect cream cheese frosting to go on top. It's still not my favorite - after all, it's not chocolate - but it certainly is a great cake to make when you'd like people to have an option besides vanilla or chocolate. 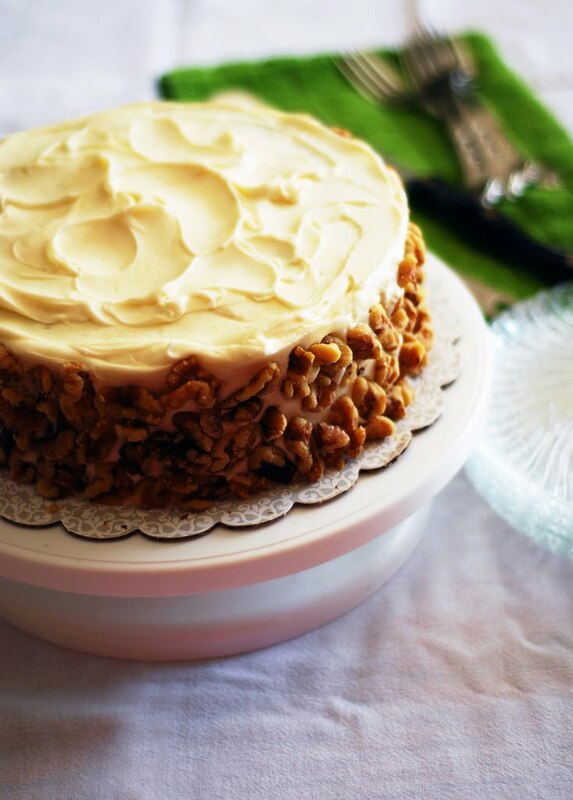 Notes on this particular recipe: I doubled these ingredients to make 2 8" layer cakes and added walnuts, coconut and raisins as well as nutmeg and ginger. You could also make 2 9" layers I'm sure, but I was cautious and took some batter out of both pans, afraid it would overflow in the oven and I'm glad I did. So in the end, I made 2 8" layers and 9 standard sized cupcakes from this recipe. Preheat the oven to 325 degrees F. and spray 2 8 or 9" round baking pans with cooking spray. Combine the oil, sugars and eggs in a large bowl and whisk until well combined. In a separate bowl, combine all the dry ingredients and spices. Add the dry ingredients and water to the oil mixture and stir until everything is mixed well. Add in the nuts, coconut, raisins and carrots and mix until everything is incorporated into the batter. Divide the batter into baking pans and bake anywhere from 25 (cupcakes) to 50 (layers) minutes, until a toothpick inserted in the center comes out clean and the cakes are well set on the top. Let cool completely and frost with cream cheese frosting.